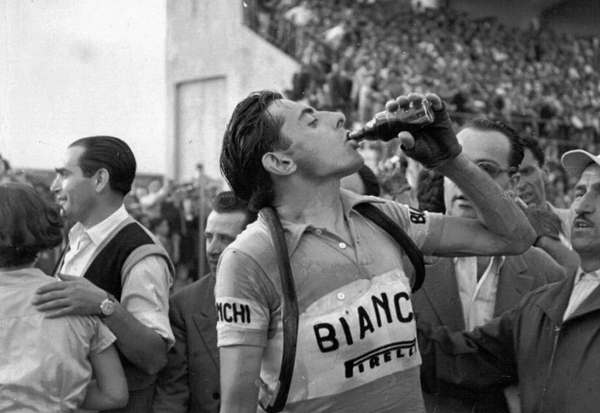 In a famous radio interview, Fausto Coppi was pretty upfront about “La Bomba”, a secret mix containing - in the words of Coppi - coffee, cola and simpamina. To the question: do all racers take “la bomba”? Coppi answered: “yes, of course. And those who claim the opposite, it’s better not to approach with fire [as they are so soaked in the secret mix themselves that they may have become flammable]. Jacques Anquetil declared “Everyone in cycling dopes himself. Those who claim they don't are liars”. When in 1966, at the Nürburgring, he was asked for a urine sample for the drug test but refused to provide it, he was disqualified, together with fellow podium finishers Altig and Poulidor. A few days later, however, the UCI reinstated all of them. Journalist Jean Leulliot remembers a dinner where Louison Bobet was being challenged by Merckx and Anquetil for saying that he had never taken drugs. But then “He was obliged to admit that he had drunk the small bottles prepared for him by his soigneur at the time without knowing exactly what they contained. Which produced laughter from Jacques Anquetil and Eddy Merckx."